Paul Nicholls started Crabbie's Grand National day with a winner as champion jockey Tony McCoy drove Lac Fontana to victory in the Grade One Pertemps Network Mersey Novices' Hurdle. The 9/2 favourite, winner of his last two starts including the County Hurdle at the Cheltenham Festival, relished the step up to two and a half miles and dug deep after the final flight to beat Splash Of Ginge by a length and a half. Nicholls said: "Obviously he stayed very well at Cheltenham, so we thought that we would go two and a half on this ground. He's tough - he made it hard for himself because he missed the last two a little bit and then he stayed on really strongly. "It is nice to start the day off with a winner and it is nice for this horse to win a Grade One. 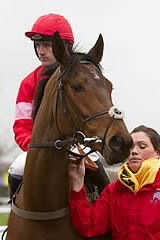 "He is tough and we knew he would stay and he stayed on well up the hill at Cheltenham last time. The plan was always to run over two and a half miles at this meeting. "He was lazy up the straight and AP said he always thought he would get to the front when he wanted to. "He will be interesting next year and might make up into a nice staying hurdler. "He has schooled over fences and has jumped well so that is an option one day but he could be smart over hurdles over staying trips." Champion jockey Tony McCoy made the best possible start to Crabbie's Grand National day when winning aboard Lac Fontana. "He's a good tough horse - he obviously won the County Hurdle at Cheltenham as a novice, which is good experience for a young horse in a handicap like that," said McCoy. "Stepping up in trip and with the ground a little dead, I half wasn't sure where the ones behind were going and if the one in front was the one to follow. "I sort of knew going to three out that Splash Of Ginge was going to keep going along in the straight. He's a solid horse as well, having won at Newbury, so was a good yardstick. It's solid form. "I thought mine was a keeping a bit for himself three out and I don't see why he wouldn't get further, he could even be better over a longer distance. He could jump a fence in time as well." Splash Of Ginge capped off a fine first season over hurdles with a battling second behind the 9/2 favourite Lac Fontana this afternoon. The 12/1 shot was well held in the Supreme Novices' Hurdle at the Cheltenham Festival last time out but had previously won the valuable Betfair Hurdle at Newbury and plugged on well under jockey Sam Twiston-Davies to take second spot, a length and a half behind the winner. "He's had a great season and run another good race there," said trainer Nigel Twiston-Davies. "I thought we were going to win it for a minute but it wasn't to be. He's very honest though and we can't complain at all. 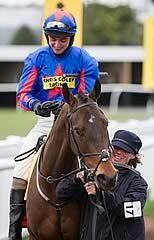 "Obviously his Newbury win was the highlight and his win here (at Aintree when he won a novice hurdle in December, 2013) was very special given that his owner is a big Liverpool fan. "That'll be it for this season though and he'll be going chasing next year." Dell' Arca's held his place in top company again today when finishing third. The Tom Scudamore-ridden five-year-old, an import from France earlier this season, finished one and a half lengths and half a length behind winner Lac Fontana and Splash Of Ginge. Trainer David Pipe said of Dell' Arca: "All season he has been running in top handicaps and, bearing in mind that he's only a novice, he should make a lovely horse for next season. "He stayed the trip well, and given that he was running on again at the finish I may well step him up in trip again. We won't make any decisions about him at this stage, we'll just take a look at him when he comes back in again later this year. "He's been running in competitive handicaps and having tough races, yet he keeps coming back for more - he's the ultimate professional." The Mersey Novices' Hurdle often features horses which ran previously in the Neptune Investment Management Novices' Hurdle, and the last to achieve victory in both races was Simonsig in 2012. The distance of the race was cut by a furlong to its present length in 1988. For a period it was sponsored by Mumm, and it was given Grade Two status in 1991. It has had several different sponsors since 1992, and the latest of these, John Smith's, began supporting the event in 2009. The Mersey Novices' Hurdle was upgraded to Grade One by the British Horseracing Board from its 2014 running.